"Serpents bride, the end awaits!" “Endless curse, blood runs cold. Human prey, no swords or armor shield you from your fate. You can't escape! Welcome to the vault of madness!" "This deck blends elements of combo with elements of control to achieve a balance between powerfull end-game strategies and all-around resilience. As a combo deck, this list wins by executing an infinite mana combo and then using it to enable a finisher of some variety. 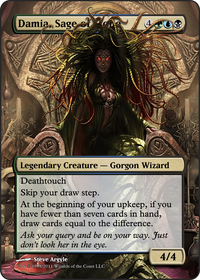 Combo is the best finisher in multiplayer Commander because it doesn’t rely on life totals or board states; rather, it secures the victory by creating an insurmountable threat that functions immediately and applies irrespective of most actions taken by opponents. It also means that the deck has a defined, consistent means of establishing victory: it uses one of a set number of combos to win in a controlled manner rather than the unreliability of combat-oriented winning." I have several Commander decks. Most are made for fun and enjoyable multiplayer games with many interactions between all players. They follow a strong theme but don’t try to win by combo in first case. This brings fun to the table as everyone takes part in the game. Many of these games can last several hours. I like those games a lot. This deck does not belong to the above mentioned ones. This deck is designed to win as fast as possible without giving fun to any other player. While “social” multiplayer games bring hours of fun to the table, this deck won’t need more than 10 turns to kill the whole table most times. It happened, that playgroups banned it after I won Turn 6 in Game 1, Turn 7 in Game 2 and Turn 6 again in Game 3. It can possibly win even faster, but that would be just a lucky opening. The current list is a semi-competitive list (at least i hope it reached this status). There is much room to improve this list and make it even more powerful by optimizing each slot. The potential of this type of deck is amazing. Memnarch : this guy will take control of all opponents stuff. Eternal Witness : blink it with Deadeye Navigator and you have infinite access to your graveyard. most times you will find a removal spell to remove anything or find a tutor to catch your whole deck and win from there. infinite into Jester's Cap will remove all opponents libraries.